Finally, after a winter of slogging away at freelance design work, I have managed to organise my time a little better to allow regular painting time. I have always felt that I should do freelance work first, and painting second (after all, it’s the freelance work that pays the bills at the moment!). As a result, I got very little painting done because by the time I found some free time, I was too tired, the light was gone, and it just seemed too late in the day to set up my drawing board. Having become thoroughly depressed by my lack of progress, I decided to make drastic changes to my daily routine, with painting my priority for the morning hours. Sounds like a simple solution, but it’s not so easy to change long-established habits! There is nothing like a little pressure to push one into making those long-overdue changes, and when the opportunity arose to submit a painting for exhibition, it gave me the impetus I needed to change. 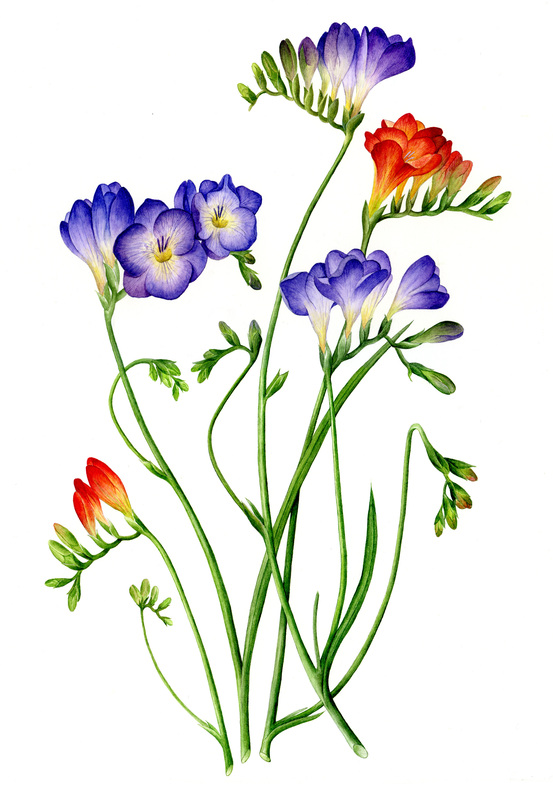 This watercolour of freesias is the result of my new work habits. Painting in the morning when the light is good, before I get caught up in all the other daily happenings and demands, has made all the difference in the world! I have found that most days – even when I have deadlines looming in my freelance work – I can manage four or five hours to draw and paint. As a rule, any more than that becomes counter-productive because I start to miss details or get sloppy. The great side benefit of this new routine is that painting relaxes me and actually helps freelance design work progress faster and better – the creative juices flow so much better! I just wish I had done this ages ago! Painting the freesias resulted in a big learning curve for me. To begin with, it is the first large piece that I have painted on hot press watercolour paper – 300lb Fabriano Artistico. Before that I used NOT watercolour paper, because I felt more confident working on a paper with a texture. However, I knew that I would never get the really crisp finish that can be achieved on hot press paper. After a few practice pieces, and more than a few mistakes and false starts, I started to feel more at home with this wonderful paper, and found that it isn’t quite as daunting as I had feared. I found it more difficult to lay down washes on the smoother surface, but detail was so much easier to paint. I found the granulation of the purples a little frustrating, and I have become aware that I need lots more practice in laying down washes with confidence. On the other hand, I am quite pleased with the colour and the composition. I sent off my entry for the art exhibition today, and now I have to wait until the end of April to find out whether the painting has been accepted. Whether it is or not, I feel that I learned a great deal from this painting, and I had fun doing it. Now I can’t wait to get on with my next painting!